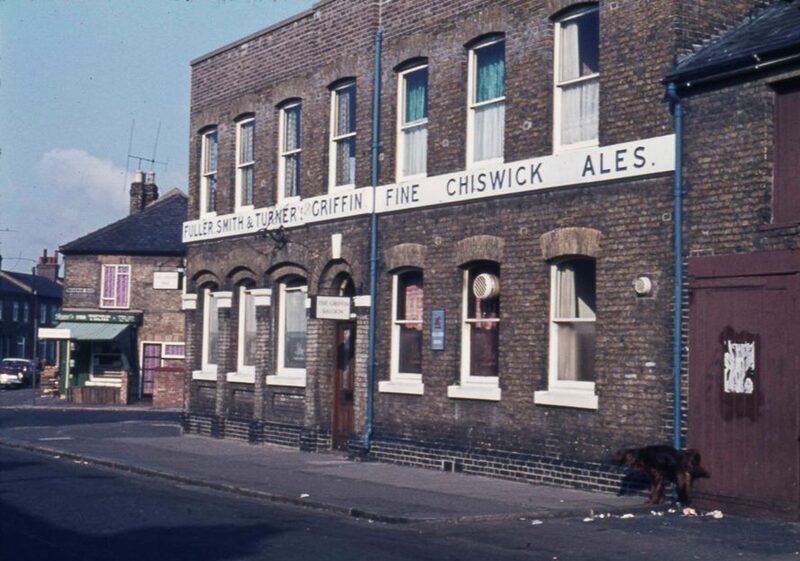 Peter Young took this photo on February 24th 1974, capturing one of the four pubs at the corners of Brentford Football Club's Griffin Park ground (and a red setter cocking his leg). The pub looks smarter from the outside today but the Fuller, Smith & Turner signage remains the same, now picked out in red. Fuller, Smith and Turner's Griffin Brewery is in Chiswick and dates back to 1828. Brentford and Chiswick Pubs by Gillian Clegg notes: 'The pub served as the first clubhouse for Brentford Football Club (formed 1889)'; it has been a Fuller, Smith and Turner pub since 1883 and was rebuilt in 1903. The pub stands on Brook Road South, on the corner with Braemar Road, and June's Vegetables and Salads occupied the opposite corner in 1974.